The Hero’s Path, 2015. 12″H x 30″W x 30″D Blown and cold worked glass and mixed media. Persephone’s Garden, 2015. 12″H x 40″W x 30″D Blown and cold worked glass and mixed media. Feast for Small Things, 2015. 12″H x 22″W x 22″D Blown and etched black glass. Guardian of the Secrets, 2015. 7″H x 55″L x 30″D Blown and cold worked glass and mixed media. Swimming in Limbo, 2015. 12″H x 40″W x 30″D Blown and cold worked glass and mixed media. We were saddened to learn of the passing of Ron Desmett on December 7, 2016. Ron reinvented the process of making glass, producing black and amorphous works that were not translucent and mocked functionality. His works were a form of eccentric beauty that were inspired by and made in nature. Ron was the best kind of human being who made a difference in our creative world. 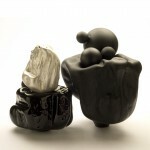 Kim Foster Gallery is pleased to present recent glass works by Ron Desmett and Kathleen Mulcahy. Each has a unique approach to the material. The recent work by Ron Desmett is less dense then his prior black “Lidded Trunk Vessels.” He sparingly introduces color into his glass forms. Several objects interact, some translucent and some opaque, making the whole feel less weighty, a more delicate balance. In “Swimming in Limbo,” Desmett creates objects floating in what appears to be an aquatic void, but in that void they have a relationship to each other as if drawn to each other by gravity. Ron Desmett lives and works in Oakdale, PA with his partner, Kathleen Mulcahy. For the past 30 years they have worked as independent artists on projects for installation in private glass collections, corporate offices, public art projects and solo exhibitions throughout the United States. They developed the Pittsburgh Glass Center. for which they were honored as Pennsylvania Artist of the Year in 2013. Their glass works are in many public and private collections including the American Craft Museum, The Corning Museum of Glass, The Carnegie Museum of Art, The Renwick Galleries of the Smithsonian Institution and The Westmoreland Museum of Art. They have won numerous awards including grants from the NEA, the Pennsylvania Council on the Arts, and a Fulbright. PA; Westminster College, New Wilmington, PA; The University of the Arts, Philadelphia, PA.